​Scroll down to see the Workshop Schedule. Our traditional close-out of the weekend festivities. The Cabaret is open to anyone and we get a mix of festival performers, instructors, participants, and kids. If you've never been you're missing out, and if you have attended, well then, you know what we mean. A sign up sheet is usually floating around the registration table all weekend. Amazing things happen when we open ourselves up to possibilities!! Due to inclement weather there will be no workshops at the First Christian Church. The below schedule has been updated and reflects the most current workshop schedule. Cancelled workshops are in red. Illustrate a tune or ballad on a scroll of paper. We'll then perform it by illuminating it from behind and rolling it by in time to the music. We will demonstrate a crankie we've made and then make one together. Bring yourself and your creativity. We'll provide all the supplies. Learn an unusual version of Twin Sisters from banjoist Sidna Myers in an alternate tuning. Command of bum-ditty and drop-thumbing required. Want to learn a really crooked calico fiddle tune?! Come on down and Sally will teach you one, with an emphasis on bowing. We'll be in AEAC# tuning. 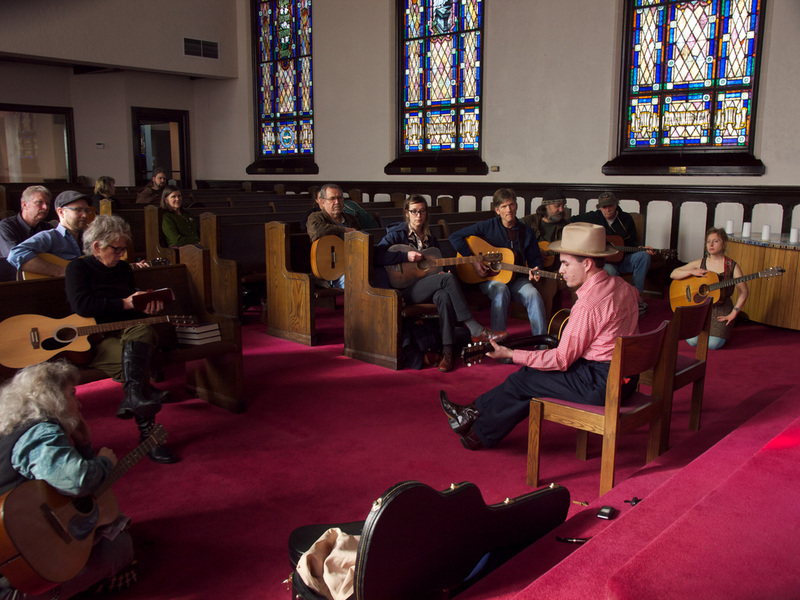 All skill levels welcome, but it will be geared toward people who know a handful of tunes. Bring a recording device. Caleb will focus on picking, as related to fiddle bowing. He'll demonstrate options for backup and getting great tone. Students need a good feel for scales and arpeggios and using the pinky finger on the 7th fret. Taught aurally and (no sheet music or tab) so bring a recording device. Tom will teach a couple of simple tunes, and will show a few basic chords and how to incorporate them into songs and melodies. There will be a couple of extra dulcimers on-hand for those who want to try it out. Put down the plectrum and get to finger pickin! This technique is used in all of the early forms of American music from blues, to old time, jazz and beyond. We'll listen to some tunes, and work on a simple song from either John Hurt or The Carter Family. Fiddling for the complete beginner! If you've wanted to try your hand at fiddle, this is a perfect place to start. Jesse will teach the basics of holding the instrument and bow, avoiding common pitfalls, and trying a simple tune. Bring a fiddle if you have one, but there will also be some loaner instruments available. Come sing with Reeb! Learn a song or two and maybe even put some harmony parts together while you're at it. 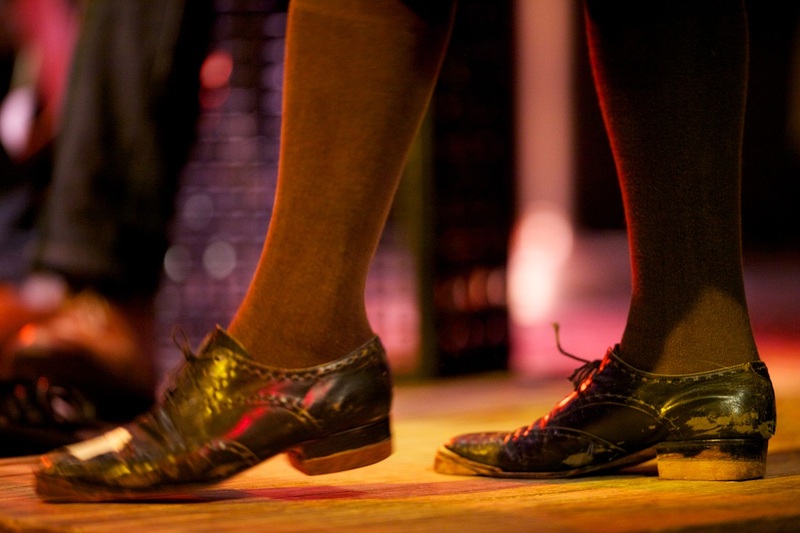 Appalachian Clogging and Flatfooting. Learn the idiomatic steps and gestures employed in percussive Appalachian dance! Wear comfortable leather-soled shoes for this class. The mandolin is a great percussive, rhythmic backup instrument. We'll talk about building basic two and three finger chords, strumming patterns and finger damping. River, Eros, Dante and Sage of The REDS Band will lead a kid-oriented jam with familiar tunes. All acoustic instruments welcome. They will help all interested youngsters participate. Charmaine Slaven & Kate Lichtenstein are the Piney Gals, who love singing the harmonies of the Carter Family. They'll pull from the classic Carter Family repertoire, teaching the different harmony parts and even how to include some Maybelle-style guitar licks for accompaniment. Dennis McGee is the Tommy Jarrell of Cajun music: his driving music is anchored in tradition and enlivened with improvisation. His "dance-orchestra-of-one" powers are at work on this cotillon (think "reel " or "breakdown"). A great crossover for old time players wanting to jump the fence! 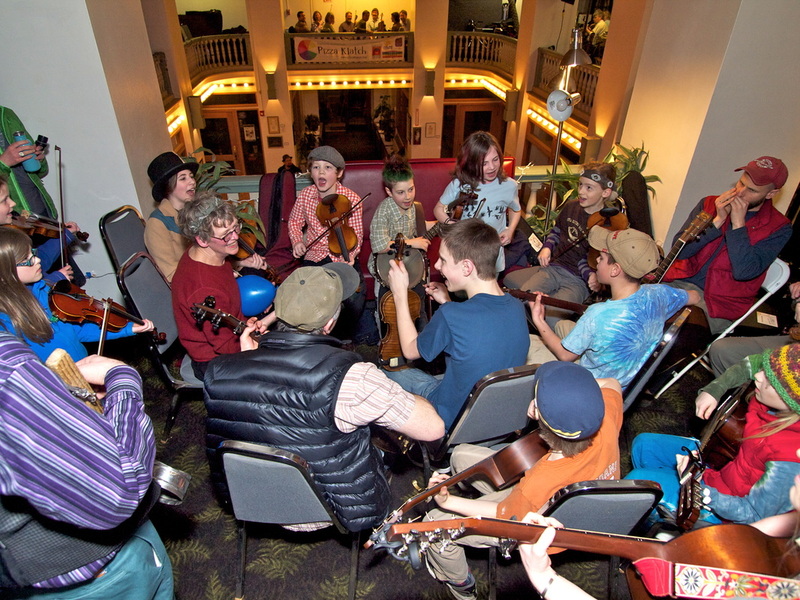 Come learn how to use, teach, and enjoy American folk music with children ages 5-85! Find resources for songs, books, dancing, and games. For the true beginner; we'll cover tuning, how to hold a pick, how to hold your guitar, strumming basic chords. Focus will be to work up to using chords to back up old-time tunes and songs. Bring a guitar, pick, and your ears & brain! Everything you wanted to know about the fiddle and forgot to ask. Radio-producer, storyteller and oldtime fiddler Joe McHugh discusses the violin's fascinating history and folklore, sharing recorded interviews and collected tunes from his travels. The "You don't even need a ukulele into to ukulele workshop." Scuff will bring 20 ukuleles and teach you to play. He'll show you two simple chord shapes that are used to play three different chords, putting thousands of songs at your fingertips. This is a square dance that is especially geared towards inclusion of youngsters. Steph Noll will lead us through a set of slightly simpler dances with the goal of having everyone included and having fun. Learn Cajun accordion with Paul Denison from Les Coeurs Criminels. Despite what the title suggests, "Two-step de Ville Platte" is actually a waltz. It's a beautiful, soaring melody and, if time allows, we'll learn both melody and seconding for this classic Cajun tune. While playing great old songs Charlie will start with basic techniques and then cover variations and some of the many interesting possibilities in playing clawhammer. All levels welcome. Want to nerd out about bowing?! Sally will teach the tune Callahan from Norman Edmons, with a variety of bowings and variations. All skill levels welcome, but it will be geared toward people who know a handful of tunes. Bring a recording device. Learn Cajun dancing - waltzes, two-steps and maybe a little zydeco! Reveal intersectional insights and bash pedagogical barriers that separate dance and music as Allison and Nic teach a tune in the same room, simultaneously. Some percussive dance experience and the ability to learn by ear, on the fly required. Experince the magical vibration of singing in harmony with others. Practice lead and harmony singing: building confidence by first learning the melody, then finding the tonic & building a chord, adding tenor and baritone parts. Most importantly, you'll have a lot of fun singing!